The US space agency's Dawn probe has gone into orbit around Ceres, the largest object in the Solar System between Mars and Jupiter. A signal from the satellite confirming its status was received by ground stations at 13:36 GMT. 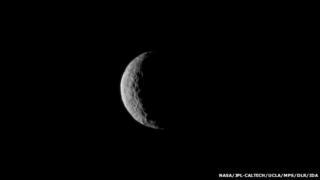 Ceres is the first of the dwarf planets to be visited by a spacecraft. Scientists hope to glean information from the object that can tell them about the Solar System's beginnings, four and a half billion years ago. Dawn has taken 7.5 years to reach its destination. Its arrival has seen it pass behind the dwarf to its "dark side". Over the next month, controllers will re-shape the orbit to get it ready to begin the prime science phase in late April. Over time, the intention is to progressively lower the orbit until the probe is just a few hundred km above the surface. By that stage, it will be returning very high resolution pictures. "We feel exhilarated," said Chris Russell, the mission's principal investigator from the University of California, Los Angeles (UCLA). "We have much to do over the next year and a half, but we are now on station with ample reserves, and a robust plan to obtain our science objectives." The satellite has turned up at Ceres having previously visited asteroid Vesta. Both objects reside in the belt of rocky debris that circles the Sun beyond Mars. Of the two, Ceres is the bigger at 950km across; Vesta has a diameter of 525km. The pair should tell a similar story, says Dr Carol Raymond, the mission's deputy principal investigator at Nasa's Jet Propulsion Laboratory. "Both Ceres and Vesta, we believe, are proto-planets. They were on their way to forming larger planetary embryos and they were the type of object that merged to form the terrestrial planets," she told the BBC's Inside Science programme. "But these two stopped before they reached that evolutionary stage, and so they are essentially these intact 'time capsules' from the very beginning of our Solar System; and that's really the motivation for why Dawn is going there to explore them in detail." Researchers think Ceres' interior is dominated by a rocky core topped by ice that is then insulated by rocky lag deposits at the surface. A big question the mission hopes to answer is whether there is a liquid ocean of water at depth. Some models suggest there could well be. The evidence will probably be found in Ceres' craters which have a muted look to them. That is, the soft interior of Ceres has undoubtedly had the effect of relaxing the craters' original hard outline. One big talking point has dominated the approach to the object: the origin and nature of two very bright spots seen inside a 92km-wide crater in the Northern Hemisphere. The speculation is that Ceres has been struck by something, exposing deeply buried ices. These will have vaporised on the airless world, perhaps leaving behind highly reflective salts. The Dawn mission is expected to work at the dwarf planet for at least 14 months. Dr Raymond commented: "The spacecraft will run out of hydrazine [fuel] at some point; it will lose the ability to maintain its attitude and therefore lose the ability to point its solar arrays towards the Sun and point its antenna towards the Earth. "It will then lose power and be a tumbling satellite of Ceres in perpetuity, because our orbit has proved to be stable over a hundred-year lifetime, as required, so we don't crash into Ceres and contaminate its surface." While Dawn takes the honour of being the first spacecraft to visit a dwarf planet, the next opportunity comes very quickly. Nasa's New Horizons probe is due to make a close flyby of Pluto in July. This far-more distant world was demoted from full planet to dwarf status at an international astronomy meeting in 2006.